How big is your agricultural world? How big is your world? Geographically, this is an easy question to answer with great precision. The diameter of the Earth at the equator is 12,756 km. Its circumference is 40,030 km along the equator, and 40,008 km through the poles. 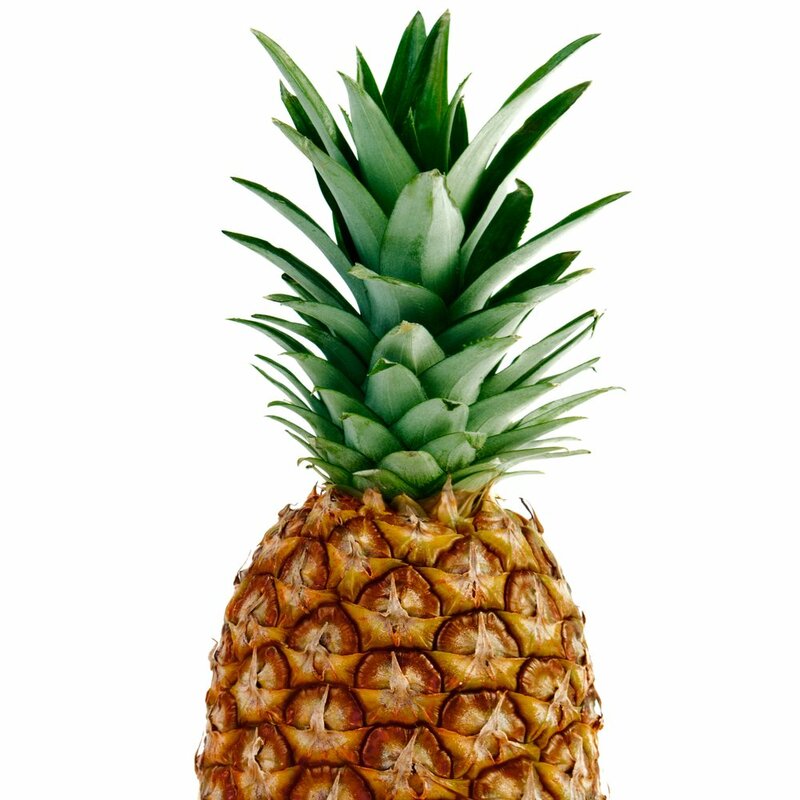 Thus the surface area of our planet is roughly 510 million sq. km. It’s a very big place. Too often, though, we’re tempted to use the conditions and events within only a short distance of our homes and farms as the basis for our opinions, and to justify our beliefs and make our decisions. This is especially obvious when discussions turn to climate change. Canada’s farmers have experienced all types of weather phenomena in 2017. 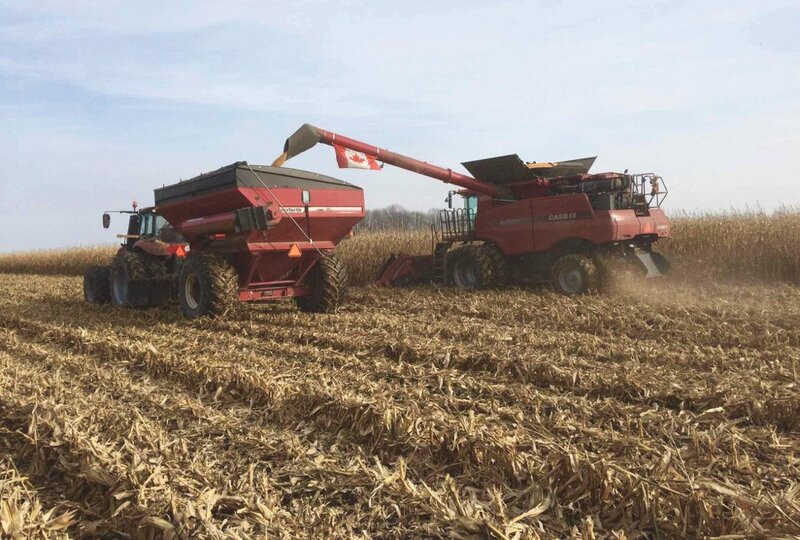 The cool, wet weather we saw last fall continued through the early spring, delaying planting across the country, and in many cases in the West complicating the harvest of crops left out over winter, while frosts were reported into June at some stations, damaging emerged crops. Climate change deniers were quick to point to the cool spring as evidence that climate change is a hoax. On the other hand, when the weather turned hot and dry across the southern Prairies in late June and July, deniers became strangely silent. Instead it was time for climate change believers living in drought-stricken areas to crow. Climate change cannot be proven by 2017’s hot, dry July in Regina any more than it can be denied by a cool May in Ontario or frosts in June in Saskatchewan. 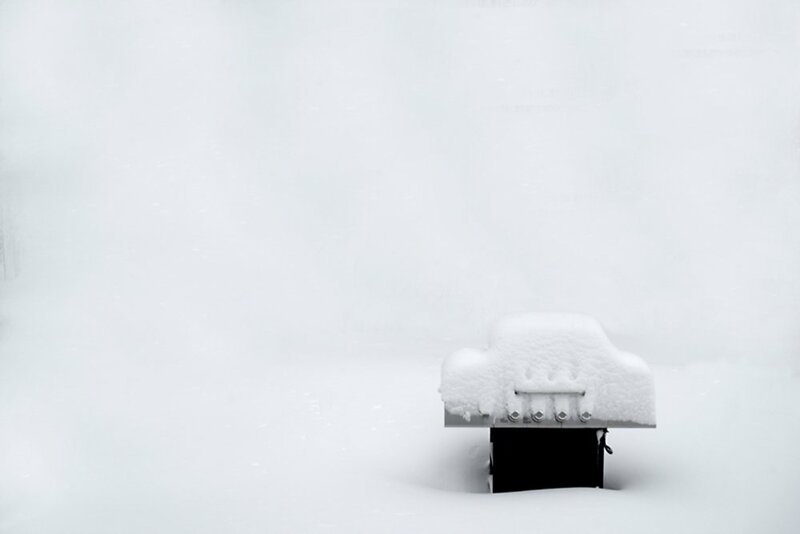 These conditions reflect weather, not climate. This is why you cannot prove or disprove climate change by the weather outside your door on a particular day. However, based on long-term weather data, you have a good idea what crops will be successful if planted in your area. So is the climate actually changing? Here is one example of how climate is changing. The maps below are from the Alberta Agriculture website. 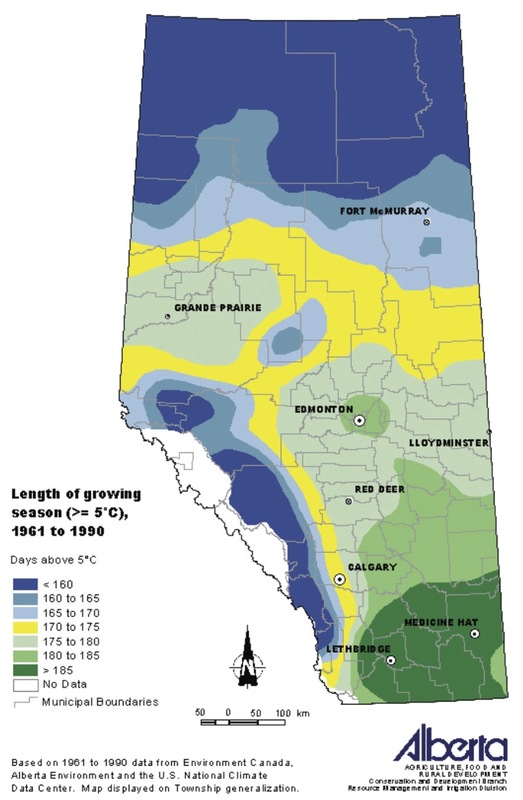 Both show the length of the growing season in Alberta based on the number of days with a temperature of 5 C or greater. The difference is that the first map is based on 30 years of environment Canada weather data beginning in 1961. The second map shows 30 years of corresponding data beginning in 1971. Length of growing season, 1961-1990. Length of growing season, 1971-2000. 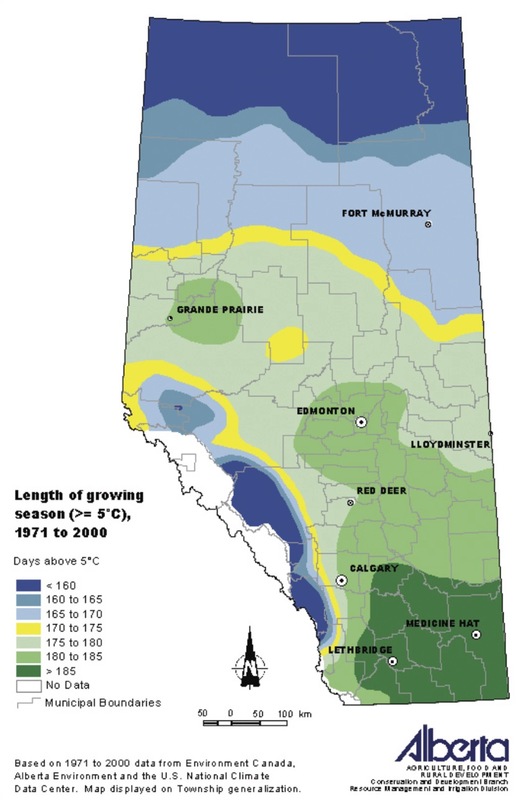 These maps show a clear lengthening of the growing season in Alberta. 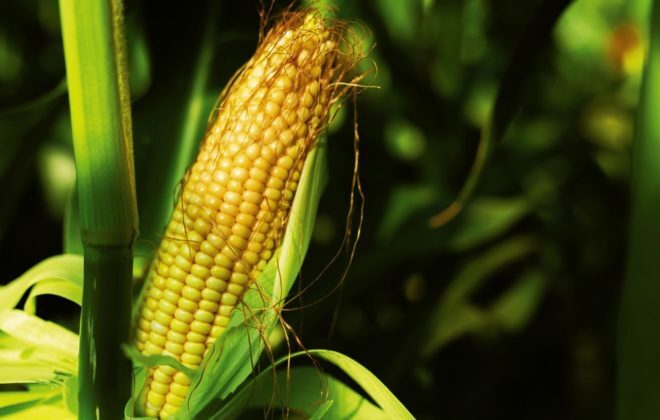 The longer growing season has enabled Alberta farmers to plant longer-season crops like corn and soybeans which were not viable a generation ago. Most readers will probably agree that there is a difference in climate between Edmonton, located in the boreal biome, and Medicine Hat in the steppe biome. While only 439 km apart, the average annual temperature is 1.9 C higher in Medicine Hat, where there is also 135.5 mm less rainfall. This temperature difference is less than the 2 C increase that many scientists are predicting for global warming. Could Edmonton-area farmers adapt to a Medicine Hat-like climate? Would rainfall decrease with a temperature rise? Or should Edmonton farmers expect more variability in rainfall due to the predicted increase in violent weather brought on by higher temperatures? Similarly, commodity prices are not determined by the crop conditions on your farm, in your neighbourhood, or even your province. It is easy for farmers to think that a lack of rainfall or an early frost in an area means prices have to go up. However, as I pointed out at the start of this column, it is a big world. Granted, 71 per cent of our planet is covered by oceans and seas. Of the land area, data from the FAO and published by the World Bank considers just 37.5 per cent of the land or roughly 49 million sq. km to be agricultural. However, less than one-third of that is classified as arable, dropping the land currently cropped in the world down to 16.3 million sq. km. 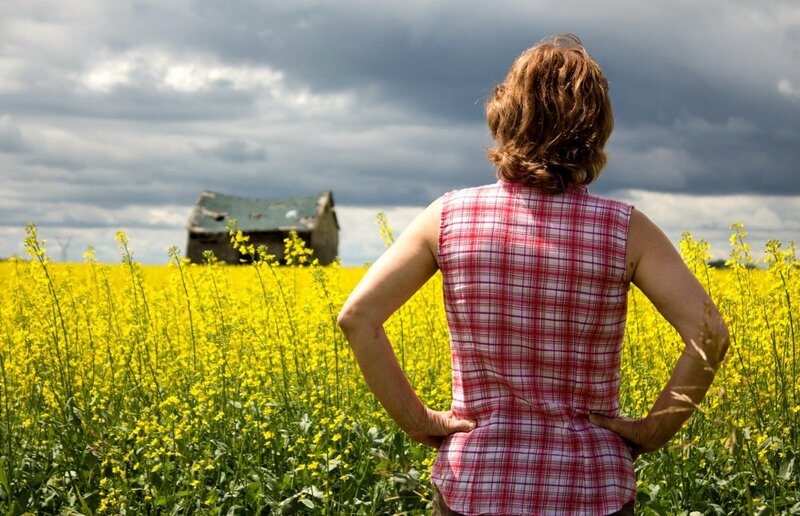 Saskatchewan has more than 40 per cent of the farmland in Canada. Yet that 40 per cent equates to less than 250,000 sq. km. 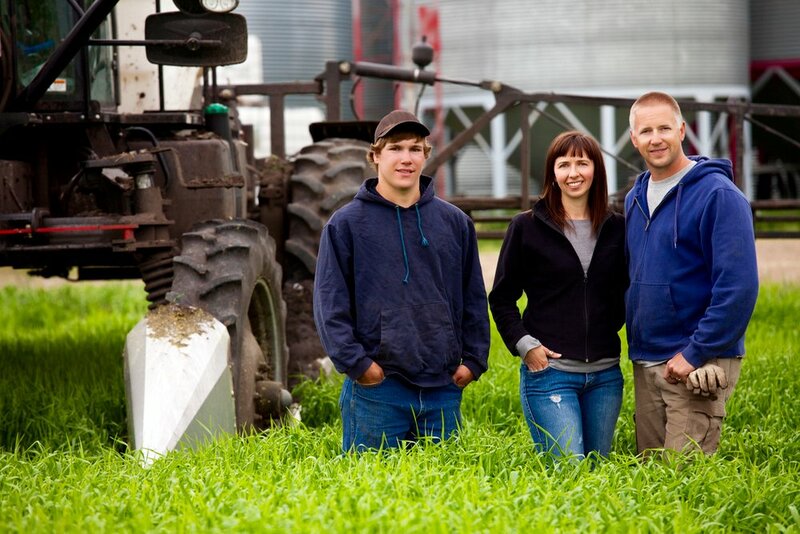 On a global scale Saskatchewan farmland amounts to only about 1.5 per cent of the arable farmland in the world. 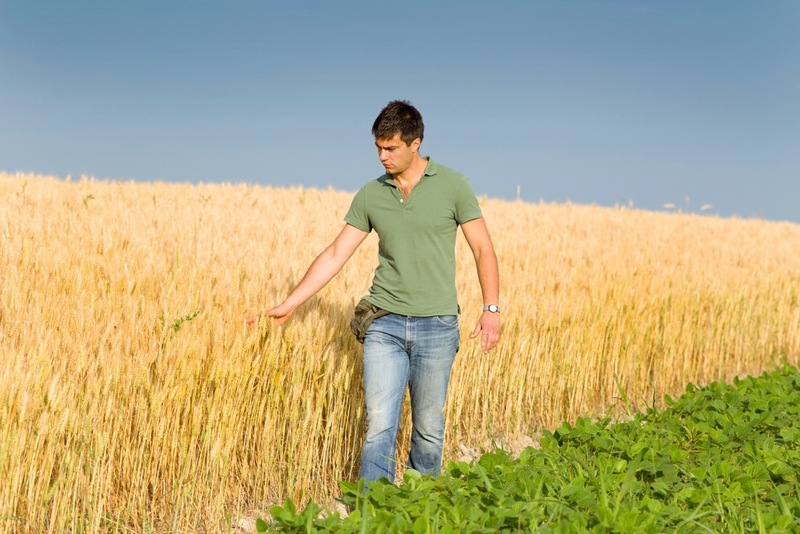 In 2015, Saskatchewan produced about 13 million tonnes of wheat. This really is a drop in the bucket compared to the 739.9 million tonnes the FAO is estimating for global wheat production this year. Furthermore, world stocks of wheat currently exceed 250 million tonnes. Even with a total wheat crop failure in Saskatchewan, there would not be a shortage of wheat in the world. Granted, wheat prices have risen this spring and summer due to weather concerns. But those concerns were not limited to dryness on the Canadian Prairies. The U.S. plains and Australia also expect that drought will decrease their wheat yields this year. But since early July, even though forecast yields continued to decline in Canada and the U.S. due to the lack of rainfall, wheat prices plateaued and even declined largely because Russia and other areas of the world are having good years and are forecasting increased wheat production. We will not know the actual production numbers until the crop is in the bin. Until that time, pricing is speculative. When we sell into the global market, we must look beyond our fields and consider the big picture. This is not to say farmers should ignore local conditions in price forecasts. Weather scares add volatility to the market and create price spikes which farmers can cash in on. A spike in price may make it possible to reach a target price that covers your costs and hopefully makes you a profit. Ignoring sales opportunities because of a localized drought in light of the huge global commodity stocks may be an expensive mistake. Another example of farmers ignoring the big picture has to do with land prices. The price of farmland in Canada has escalated far beyond its productive value. While high commodity prices may have initiated the price rise a few years ago, low interest rates, speculation, investment opportunities, and the security that land offers are equally important. But there are two other drivers of the increase in land prices that play a significant role, at least subconsciously. Or are “they?” Earlier I pointed out that only a third of the world’s agricultural land is rated arable, i.e. it is being plowed and growing crops. Yet there is a huge cumulative acreage of pasture lands, native grasslands, and forests with the potential to grow crops. Granted, they may not be as productive as lands currently being farmed, or there may be a lack of infrastructure such as roads, rail, and services. There may be weather constraints such as short growing seasons or lack of rainfall, but climate change could open up additional lands for farming (or make areas currently being farmed less productive). According to published World Bank figures, the amount of arable land in the world actually increased from 9.693 million sq. km in 1961 to 10.924 million sq. km in 2014 — an increase of 1.231 million sq. km. This increase is roughly double the amount of land now farmed in Canada! Some of this new farmland, such as the brushed Amazon rainforest even has the capability to produce two crops per year, making it significantly more productive than our farms. When the Soviet Union collapsed, six million ha of land being farmed in Kazakhstan in 1992 reverted back to native grassland due to the failure of collective farms. Now this land is slowly being opened back up to cropping. 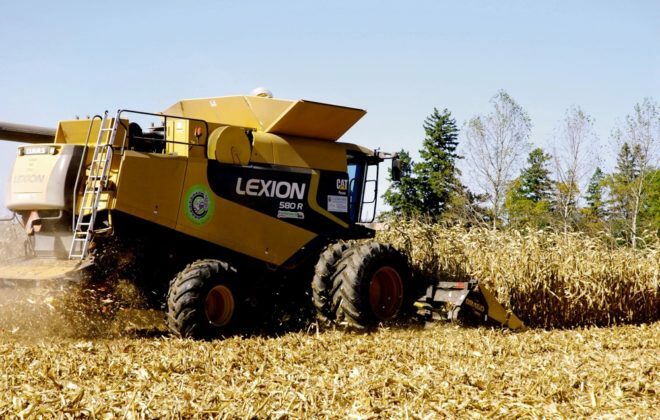 There are the land resources needed to feed the world, and it will be farmed as the demand for food and as the climate, economics and politics entice farmers, investors and entrepreneurs to open up underutilized agricultural frontiers. The point of this article is that it is very easy to miss the forest for the trees. 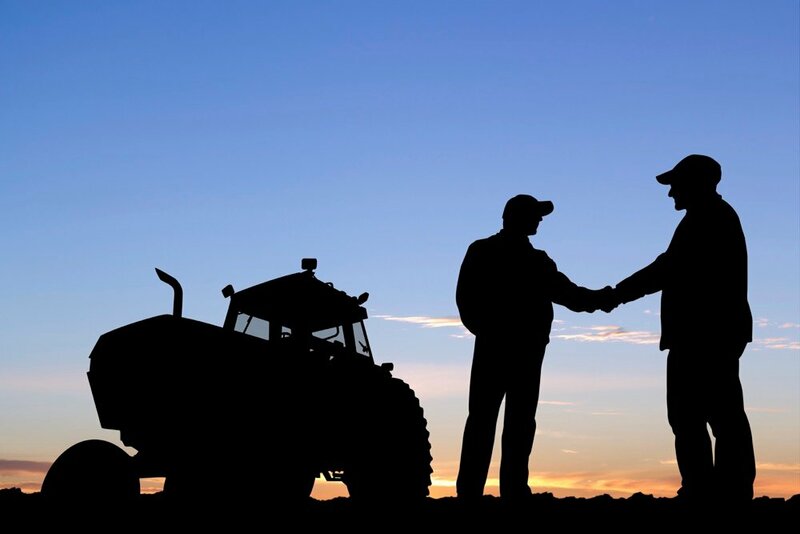 Farmers are so tied to their own crops and land, they fail to see, or even look, at the big picture. Yet agriculture is now dominated by a few multinational companies and it truly is a single global market. You either have to accept that you are a small player in a very big world, or find a way to shrink that world and find and supply a local market.